A new tower called Shibuya Stream will open in the trendy Tokyo district on Sept 13. As the name suggests, this new tower located at the south exit of Shibuya Station aims to create an open space that is both urban and has a touch of nature to attract a continuous stream of visitors. The new building consists of 35 stories above ground with the first to third floor dedicated to restaurants and the fourth to six floors to concert halls, while the upper floors are occupied by offices and Excel Hotel Tokyu. The fourth floor also has a cycling cafe and recreation space where many sports events will take place. 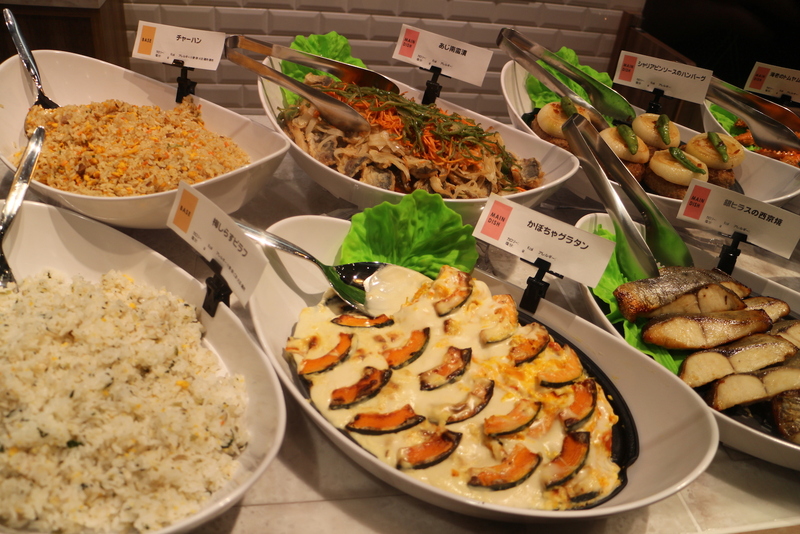 There are a about 30 restaurants with a variety to choose from, including Mexican cuisine, burgers and fries, sushi, and Spanish seafood. A mini supermarket, Precce Shibuya DELIMARKET on the second floor sells bento prepared and packaged on the spot for those who want to grab something on the go. There is also space to eat inside. 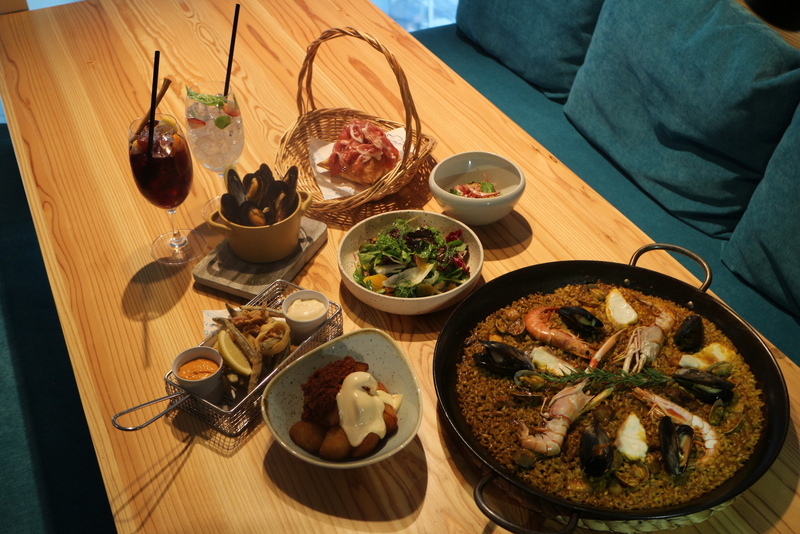 One restaurant to watch out for is the Spanish restaurant XIRINGUITO Escriba, which is said to offer the best paella dish of Barcelona. 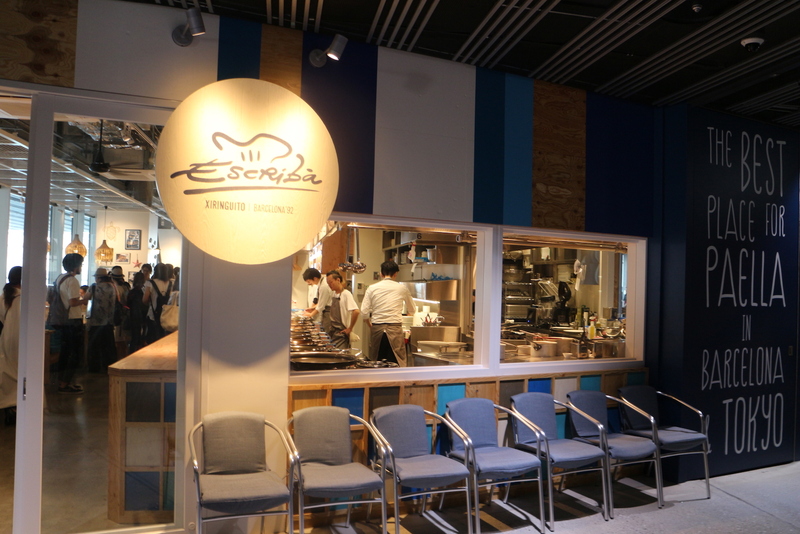 The restaurant will be opening in Japan for the first time. 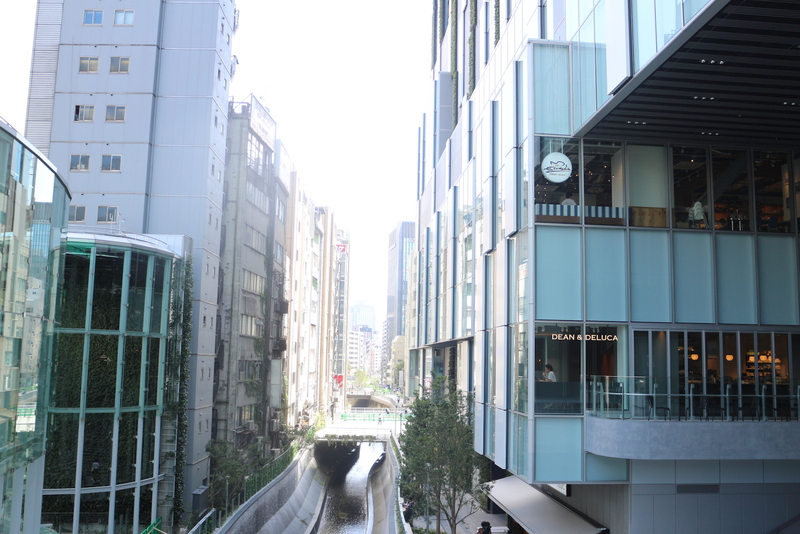 The Shibuya Stream project was made possible through the redevelopment of land that was once used by the Toyoko line. The Shibuya River which flows just in front of the Shibuya Stream tower also went through restoration so that pedestrians can enjoy the refreshing landscape. At the end of the pedestrian walkway along the Shibuya River is Shibuya Bridge, another building containing restaurants, hotel rooms, offices, and a nursery. This new project seeks to further enhance the amenity of Shibuya for residents, workers and tourists alike. The south side of Shibuya Station is not known to be as swarming with people as the Hachiko crossing, but developers hope that through these new buildings, more people will get to experience a new side of Shibuya. this new tower located at the south exit of Shibuya Station aims to create an open space that is both urban and has a touch of nature to attract a continuous stream of visitors. What? Two plants and a tree? Eh, you can put any design in that area and people will visit due to the location and variety of shops although with the likely pricing I wonder how many people will actually be customers! Take a look at that first photo, of the entrance. It has all you expect from a new Tokyo building - sharp lines, splashes of colour, lots of screens - and utter sterility. Once again, there is nit a single place to sit. Not one bench. Old? Disabled? Carrying bags or children? Need a rest? Tough, the only place to sit will be in the expensive cafes and restaurants. The total lack of any kind of public seating expose these developments for what they are, pure money-making ventures that have no intention of looking after their visitors, let alone the wider community around them. Well yeah, its not a public building. 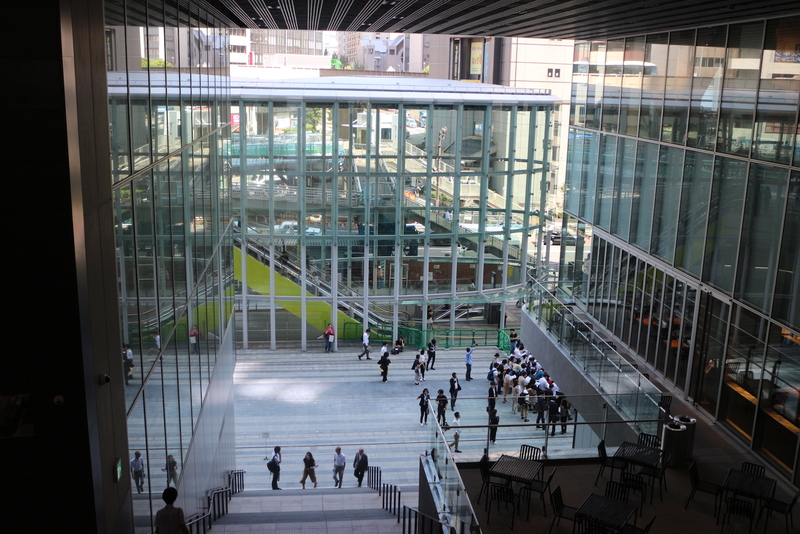 It's a private building mainly used for office space, that opens its first few floors to the public. So you're right, it is 100% a money-making venture. However, we can't be 100% sure. The first photo and the following photos don't show the surrounding sidewalk. There might be some benches outside. Also, if you look at the stairs, they are leading to a wall. I.E they are meant to be sat on. So there is your seating right there. They look like normal stairs because continuity. Which, from a design standpoint, makes sense. The entrance area was likely designed to double as an event space. Permanent seating there would make that impossible. 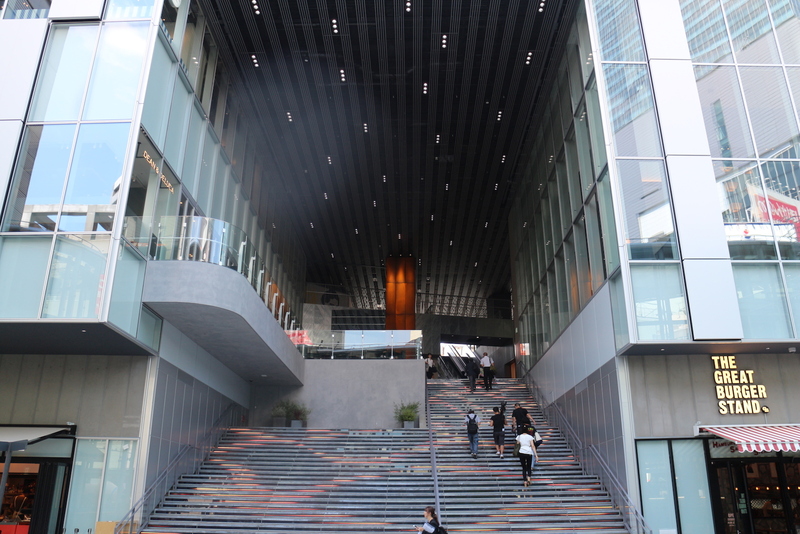 Since the building also includes a hotel, multiple concert halls etc, the entrance has to be able to handle a large amount of pedestrian traffic from shoppers, hotel patrons, office workers, and concert-goers. As for the nature, the building is covered in living walls on the outside. As well as being open to the sunlight and the Shibuya river right outside. Its downtown Tokyo, were you expecting a park? The first photo and the following photos don't show the surrounding sidewalk. There might be some benches outside. Probably not though - this country has a serious lack of benches. What I don't get is why someone would expect this would be anything other than a money making venture. Does a river made of concrete represent nature? Another tall building will make Shibuya and all train lines leading to Shibuya more crowded, more unpleasant, less of an attraction. Also, if you look at the stairs, they are leading to a wall. I.E they are meant to be sat on. Do you actually live in Tokyo? Sitting on steps is as taboo here as sitting on the floor. And no, there are no public benches outside, there are precious few public benches in any Shibuya street. Pretty much the only place to sit in Shibuya is on the low brick wall that circles round the back and sides of the Hachiko statue. I imagine that you are young. When you get old you will begin to understand how vital public seating is, and how cruel this city is without it. Yes, it's a private building, but a little kindness to its visitors wouldn't harm anyone. Say what? Do you ever go to Shibuya? If there is anywhere in Tokyo people will be sitting on steps, it will be there. The bits above Shibuya Stream on the top pic remind me of lit cigarettes LOL!! Can only hope the entire structure is NON-SMOKING. Then get around to adding benches, for pity's sake! Lol, I've just given myself a headache wondering why I would ever need to go in there? I can't think of any reason. The Shibuya “River” is all concrete around that area. I saw a TV show a few years back where the reporters attempted to follow the “river” past where it goes underground, but noxious gases forced them to cut their expedition short. To be fair, at other sections of the stream there are more trees being planted. But if you stray from beneath the canopy of the trees and happen to actually look down at the stream you may find....a cute, miniature version of the LA river. Also, the big new building that was built right next to this one is pretty ugly. And both are pretty uninspired blocks. I'm kind of surprised that Google Japan and other companies are choosing to re-locate here because these developments don't seem "innovative" in any shape or form. I don't live in Tokyo, but I do live in Sendai which also lacks the same public seating, and I visit Tokyo almost weekly because of work. My office is in Daikanyama, so I know Shibuya pretty well. As I mentioned in my previous comment, from an architectural standpoint the stairs are meant to supplement seating. Yes sitting on stairs in Tokyo is a taboo, as it is anywhere. But only when the stairs are used as access methods and you're impeding people. Im not saying I would do it, but from a design standpoint that's likely what they were intended to be. You're right I am young, but I understand the need for public seating. However, keep in mind the demographics of Shibuya are generally younger, wealthier people. They can afford to go to a cafe in this building and sit there for an hour or so. You can't please everyone, but I think the designers did a pretty decent job with the relatively small plot of land they were allocated for this multi-functional complex. I'll give them props for trying at least. Anyone who thinks otherwise doesn't understand real-estate development.